I am fairly new to high hydration doughs. I like everything about them, including the challenges they through at you. A few days ago, I baked 3 baguettes - 66% hydration and the crust generated a beautiful crackling sound as it cooled just after baking. Then, using the same ingredients, I increased the hydration to 70%. I liked both the 66 and the 70% hydration resulting breads. May have a preference to the 70% look, feel and taste, including the somewhat larger holes in the 70%, but these made no cracking sounds.! The question is.... is there a relation between the crackling sound and the best or ideal % hydration for a particular recipe. Yes, I still need to work more on the lame skills! Pretty A+ looking bague if you ask me! Thanks for your interest in the subject - Mini Oven. Let me see if I can state my question better! I guess that what I am trying to find out is, if there is a relation between the crackling sound the baguettes made while cooling, and lets say, hitting the spot in the balance of ingredients used and procedures followed for that particular recipe. 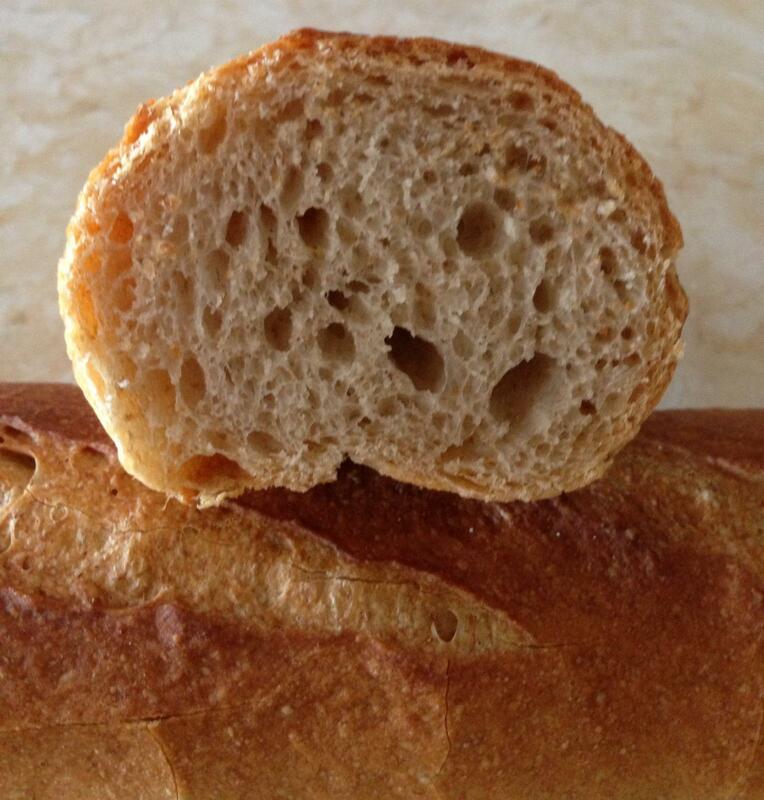 Only changing water amount, the 70% hydration baguettes did no crackling sounds? On another note, I guess you know about our recent ridiculous water and electricity rate increases!!!!!! how about baking to the same % of water loss? weigh the dough before baking recording the hydration & weight, bake to crispy crackling and singing... weigh again. Calculate the water loss. Now raise the hydration of the dough (flour the same) and bake until the baguette(s) has the same water loss or continue baking until they have the same weight. (that would mean more water loss calculated for this loaf... right?) Now compare them in singing, texture, color, taste etc. bake time the same or did it take longer? Did one seem dryer than the other? Or did they come out about the same with one heavier than the other. I guess the thing to do next is to "go back" mix and bake 66% hydration dough (all else remaining the same) and see if it makes the crackling sound again! I have seen a KAF video in which they mention the crackling sound, but make no reference to its implications as to balance between type of flour and its optimal hydration level! It is a beautiful and very impressive sound and I am hypothesizing it must mean something. Maybe I am chasing a ghost, but the search is interesting. I weigh and follow all recipe values, however, only just recently started to weigh the loafs after they cooled! The baguette is loosing 46% of its 71% water, for a baguette water content of 33% On average they go in weighing 351 gr and come out at 283 gr. Ha! Water cost is higher than in any state - but manageable!